I've been reading a Young Adult fiction series. It's really good. It has caused me to do a lot of thinking about courage, fear, and trusting God. I am going to do a longer post on it this week. 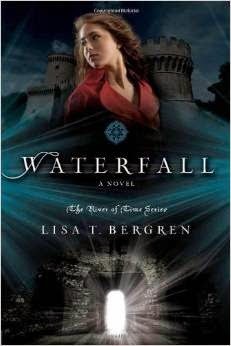 It's called The River of Time series by Lisa T. Bergren. I have been thinking about how God wants us to pray for our leaders so that we can lead quiet and peaceable lives in the land. (1Timothy 2) I don't really do that much at all. I tend to get irritated and angry about the choices that our leadership is making. I do believe that God would have us pray, and then I believe He wants us to go about our daily lives, reaching out to our neighbors, loving one another, being kind, helping the poor. We can trust Him for all the rest. Easter is two weeks away. I am thankful for what Easter means. Hope, Love, Joy, Forgiveness, because of the Resurrection. I know that I don't pray often enough for our leaders, yet we are instructed to do so! How easy it is for Christians to get entangled with the world's affairs and to stew and fret over it all, when, as you have said, we are really supposed to go about our lives, serving Him with our hearts, and wholly trusting in His plan. Faith is trusting Him whether we see His purpose or not. It is so heart-stirring to think on His sacrifice and His resurrection! I don't pray for our leaders like I should either! I am going to put that in my Prayer Box to help me remember to do just that! Enjoy your day dear friend, HUGS! Sigh. The times are truly evil. I think of those who fought against "the powers that were" in former times. Not sure where prayer fits. I usually pray that God has His perfect will in any person's life. It's nice when even a novel can cause us to pause and think!